Another thing we tried, while in Rome was Calzone. Although I had heard of calzone, I thought it would be much smaller and imagined it to be something like a turnover with phyllo pastry, similar to the Greek bourekia otherwise called Kaltsounia in Crete (do you see any similarities in the name?). However, kaltsounia are totally different and I will write a separate post about them. However, it was huge and was practically like a pizza folded in two, only it had sauce inside. Technically, what they brough us was not a calzone but a stromboli, maybe it was named after the volcano Stromboli (Sicilian: Stròmbuli, Greek: Στρογγύλη Strongulē) and someone plump in Greek is called στρομπουλή (fem.) or στρουμπουλή strombuli. My husband ordered a roasted chicken with potatoes, together with a salad and wine and tiramissu was included in the price of the dish. You can imagine how much we ate that evening. Both of us could have eaten well, just eating that calzone and the salad. I tried some of the roasted chicken with potatoes but it was similar to the way we make it in Greece, so I preferred the calzone/stromboli which had the most amazing tomato sauce inside and it was filled with mushrooms and other ingredients I do not remember and of course melting mozarella. (Sorry for the bad quality of photo but the lighting in the restaurant was very poor). When we came back, I made some calzone using the Italian cheeses. The ingredients given below are enough to make twelve calzones but I did not use all the ingredients as I wanted to save some of the cheeses to make another recipe. The remaining I filled with smoked turkey and milner cheese. Preparate the dough, according to the instructions given. While the dough is resting prepare the pizza sauce. Grate the cheeses and mix in the egg yolk. Preheat oven at 180 degrees C and line a baking tin with parchment paper. Divide the dough in twelve equal pieces and roll each piece of dough into discs about 20 cm diameter. Spread 1 tablespoon of marinara sauce leaving a 3 cm edge without sauce. Add 1 mozzarella slice, 1 piece of prosciutto and some cheese mixture. 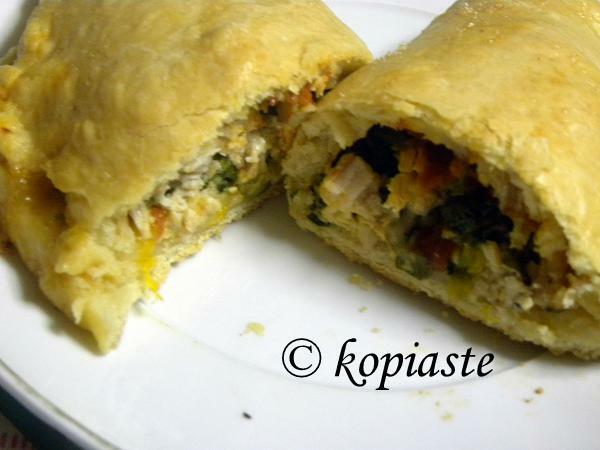 Fold dough over to enclose the filling and form a large turnover. Roll up the edges with your fingers to close tightly and prevent leaking or just press the two edges with a fork. Brush with the egg white and bake for about 30 minutes or until golden brown..
Let the calzones rest 10 minutes before cutting to allow the cheese to set. A few days later I had some leftover Greek roasted chicken, and as these calzone are very delicious and easy to make, I made them again this time using some other ingredients I had at hand. Mix all the filling ingredients together and make calzone the same way as above. hi,ivy,nice to see you again!and calzone…mouthwatering! That filling is fantastic! Great shot of you! Have a wonderful week, Ivy! Ivy mon amie, j'adore les calzone, je note ta recette. Delicious Ivy! Calzone are always a favourite no matter what they put inside. Thanks for clearing up the differences between that and stromboli. Hey Ivy, this looks great! You can make me pizza any day. Glad to hear you're enjoying the fine Athens weather. The calzones look outstanding! I love the picture of you cooking in the kitchen! I've been wanting to make calzones. We get good ones in a restaurant here, but it would be fun to try. Thanks for the incentive. That calzone filling sounds delicious!I like your step by step pictures. 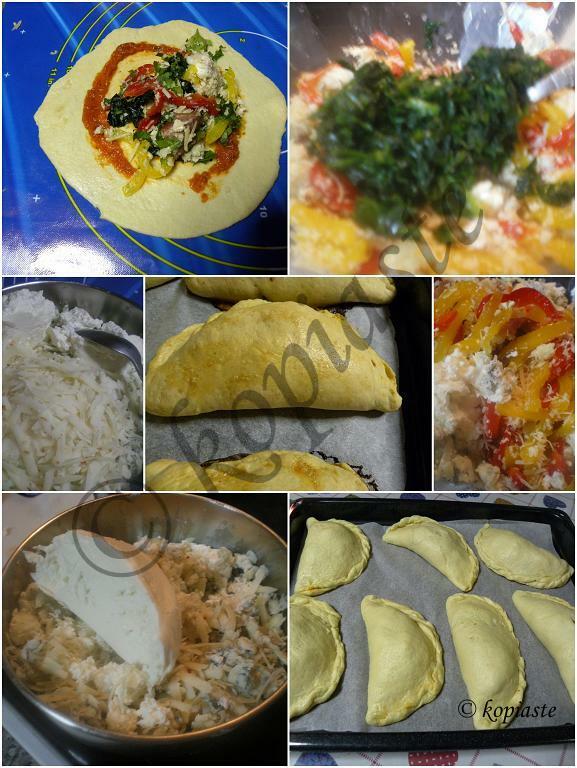 Great to see u in action Ivy:)…the calzones look fabulous, the filling sounds yumm! Wow these look great. They remind me of empanadas only love the idea of the sauce being inside. Such a great idea to use your leftover chicken. I know what you mean. Love calzones, tasty and very filling. Ciao Ivy ! Your calzoni are really beautiful !! I’m sure they are better than the ones you ate in Roma !!! Great job, bravissima !!! Baci ! I love calzones and yes, they can be BIG, but always delicious. That calzone looks delicious Ivy! I haven't made them in a lone time…we make pizza at home once a week, but I should make calzone soon! Yummy calzones… filling sounds so delicious! A happy cook is a good cook! Calzones are wonderful for cleaning out odds & ends in the fridge…love'em. Ivy, you have a big kitchen! These calzone look very delicious! I love Calzone Ivy!!! And it's great to see you there in the middle of your kitchen 😀 😀 :D.
I never made it myself, so thanks for the recipe! I've eaten many a calzone here in NY and yours looks delicious Ivy! Lovely flavors. Wow, your pizza and calzone recipes make me realize i have not made pizza for a long time. Time for it. Sometimes once you start you cannot stop isn't it. MMM I can taste both calzones already!